Steam engines are mechanisms that use heat to create steam, which in turn performs mechanical processes, known generally as work. While several inventors and innovators worked on various aspects of using steam for power, the major development of early steam engines involves three inventors and three principal engine designs. The first steam engine used for work was patented by the Englishman Thomas Savery in 1698 and was used to pump water out of mine shafts. The basic process involved a cylinder that was filled with water. Steam was then delivered to the cylinder, displacing the water, which flowed out through a one-way valve. Once all of the water was ejected, the cylinder was sprayed with cool water to drop the cylinder's temperature and condense the steam inside. This created a vacuum inside the cylinder, which then pulled up additional water to refill the cylinder, completing the pump cycle. Another Englishman, Thomas Newcomen, improved on Slavery's pump with a design he developed around 1712. Newcomen's engine included a piston inside of a cylinder. The top of the piston was connected to one end of a pivoting beam. A pump mechanism was connected to the other end of the beam so that water was drawn up whenever the beam tilted up on the pump end. To propel the pump, steam was delivered to the piston cylinder. 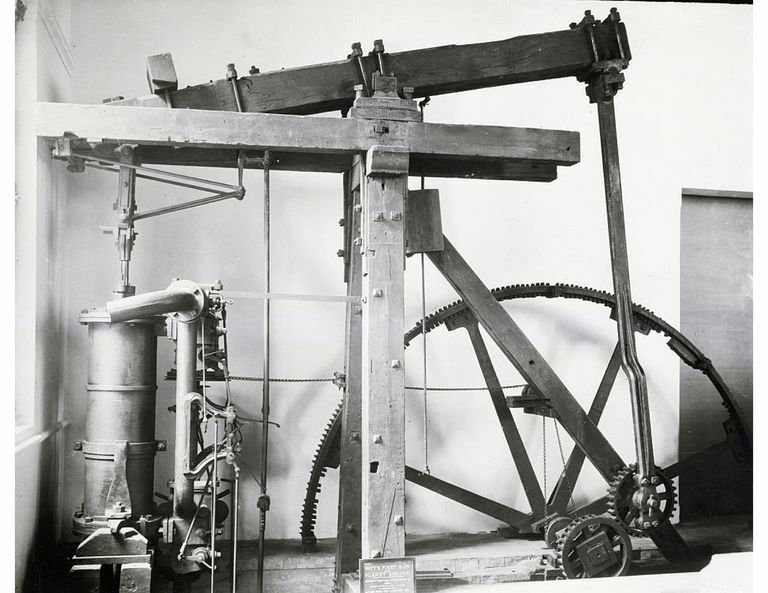 At the same time, a counterweight pulled the beam down on the pump end, which made the piston rise to the top of the steam cylinder. Once the cylinder was full of steam, cool water was sprayed inside the cylinder, quickly condensing the steam and creating a vacuum inside the cylinder. This caused the piston to drop, moving the beam down on the piston end and up on the pump end. The cycle then repeated automatically as long as steam was applied to the cylinder. Newcomen's piston design effectively created a separation between the water being pumped out and the cylinder used to create the pumping power. This greatly improved on the efficiency of Slavery's original design. However, because Savery's held a broad patent on his own steam pump, Newcomen had to collaborate with Savery to patent the piston pump. Scotsman James Watt significantly improved and developed the steam engine over the second half of the 18th century, making it a truly viable piece of machinery that helped start the Industrial Revolution. The first major innovation of Watt's was to include a separate condenser so that the steam didn't have to be cooled in the same cylinder that contained the piston. This meant the piston cylinder remained at a much more consistent temperature, greatly increasing the fuel efficiency of the engine. Watt also developed an engine that could rotate a shaft, rather than an up-and-down pumping action, as well as a flywheel that allowed for smooth power transfer between the engine and the workload. With these and other innovations, the steam engine became applicable to a variety of factory processes, and Watt and his business partner, Matthew Boulton, built several hundred engines for industrial use. The early 19th century saw major innovation of high-pressure steam engines, which were much more efficient than the low-pressure designs of Watt's and the others steam-engine pioneers. This led to the development of much smaller, more powerful steam engines that could be used to power trains and boats and to perform a wider range of industrial tasks, such as running saws in mills. Two important innovators of these engines were American Oliver Evans and Englishman Richard Trevithick. Over time, steam engines were replaced by the internal combustion engine for most types of locomotion and industrial work, but the use of steam generators to create electricity remains an important part of electrical power production today.